In 2014 I had the opportunity to mentor a group of high school students who were building a robot for the FIRST Robotics Competition (FRC). FRC is a yearly competition organized by Dean Kamen's FIRST (For Inspiration and Recognition in Science and Technology) organization. Around the beginning of the calendar year, a set of goals and rules are released, around which the robot must be built. In 2014, the game was called Aerial Assist, and the following youtube video explains the various goals and rules. Bloomberg LP, the company I work for, sponsors 16 FRC teams in the New York area. In addition to financial support, Bloomberg offers the teams mentors drawn from a group of Bloomberg volunteers like me, to help with instructing the students as well as to get the students familiar with Bloomberg. I was paired with Frederick Douglass Academy, whose team calls themselves the Harlem Knights! The team had just bought a 3D printer and CNC machine, so given my background with CAD, machining, and 3D printing I was able to contribute a lot towards efforts to utilize those new tools in the 2014 robot. Most of my mentoring was spent teaching the students how to use Autodesk Inventor, a Computer Aided Design (CAD) tool that is widely used by mechanical engineers in industry, how to use their recently purchased MarketBot Replicator 2X, and various hand tools and methods of building things. I strove to be as hands-off as possible, so that the students would get as much hands-on experience as possible. They really impressed me with their ability to pick up and apply the skills I taught them. Several students got to quite proficient with CAD and 3D printing, below is a photo of a printed out mascot, that one of my students modeled himself of his own accord! Tinko lives! 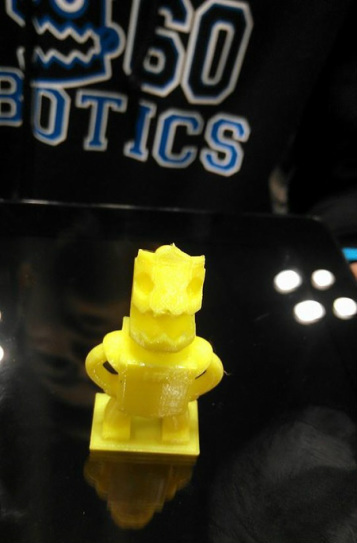 A 3D print of a model of the team mascot, created and printed entirely by a sophomore student team member. 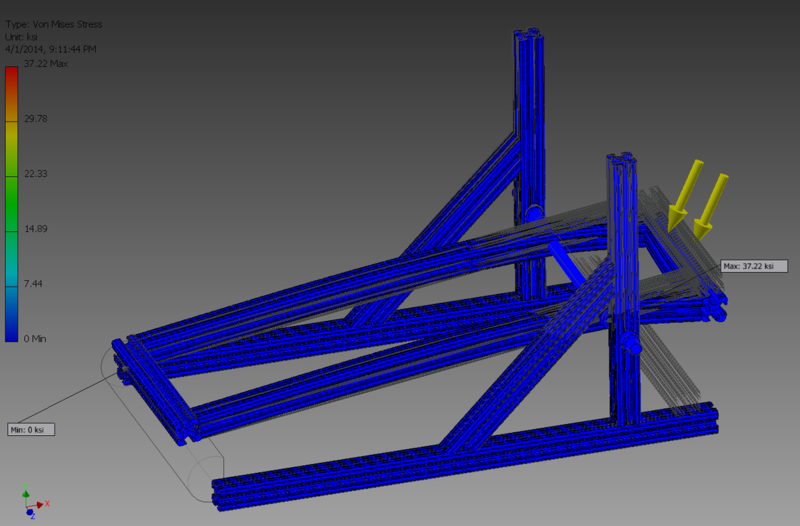 The Harlem Knights' launcher mechanism for FRC 2014. The long, slightly narrower frame would rotate on the axis seen towards the right, launching the ball, which would sit at the left edge of the frame as seen in this picture, into the air. The power from the launch came from elastic bands (not pictured) which were wrapped along the blue lines visible on the right. A strap (also not pictured) would attach to the frame on the left side, and pull the frame down via a motor located in the chassis, beneath this assembly. The design pictured is actually the final design. An earlier design had the axis of rotation not going directly through the frame, but through bearings that were attached to the t-slot via sliding nuts. Unfortunately, the power of the launcher would overwhelm the bearings and they would break. 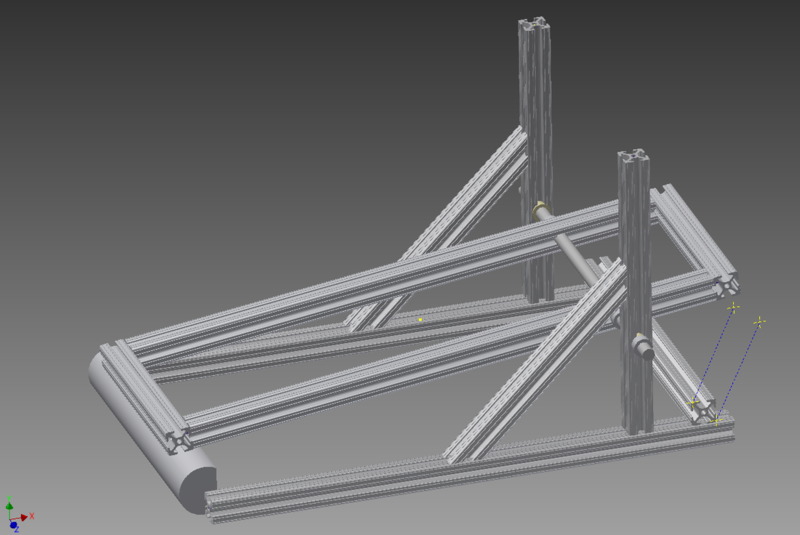 Removing the bearings and placing the axis directly through the frame led to some concerns that it might weaken the t-slot structure, so I did a Finite Element Analysis on the model, results below. 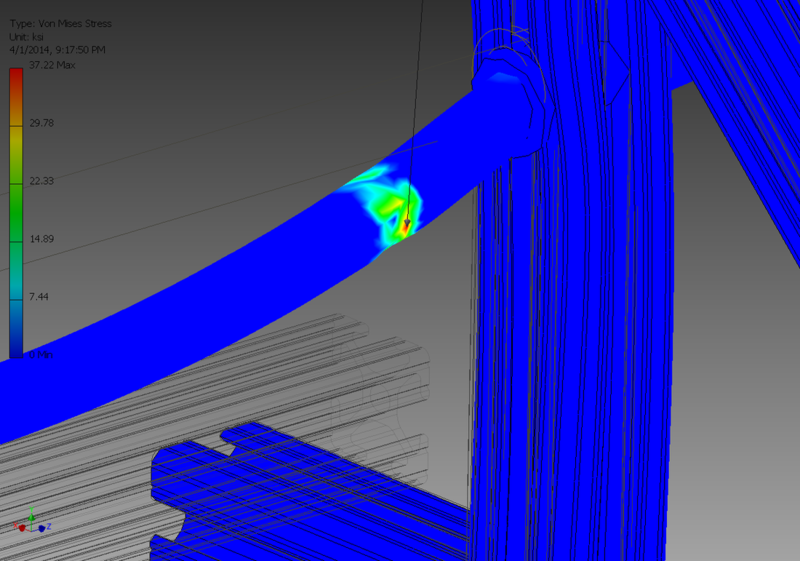 With appropriate loads and constraints applied, mimicking the forces experienced by the real launcher, an FEA was performed. Most of the structure is unaffected. The area pointed to by the "Max" label is shown in greater detail below. The overall result from the simulation was that the majority of the structure would be unaffected, but that there would be a few regions with high concentrations of stress. Below is a closeup of one of those regions, with a collar that is meant to hold the rod in place made invisible, so that the stresses can be better seen. The point of maximum stress on the launcher. There is a collar here which has been made invisible in order to show the stress. Note the grey outlines of the undeformed frame. The deformation has been exaggerated for better viewing. Since the rod we would be using for the axis was made of 1566 steel, we were well under the yield stress, which is around 150 ksi.